What are Those Multi-viscosity Figures on the Side of an Oil Can? The viscosity of an oil is determined by the Society of Automotive Engineers (SAE) through extensive testing at various temperatures. Viscosity is the term used to describe the lubricating capability of oil. To lubricate, the oil must cover connecting parts that move, bend, and grind together. The viscosity of the oil describes the oil’s capacity to separate the parts to keep them from harm. When the label on the side of the oil can states 5W-30, it means that the oil works like a 5-weight oil during startups under cold conditions and as a 30-weight oil when the car is running. The amount of current needed to turn over your engine escalates under winter conditions. The lower the viscosity at startup, the less power needed. 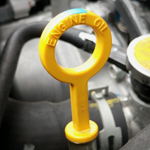 At Nelson Kia, we offer every oil viscosity that your car manufacturer requires.